This week, Star Wars Rebels gave us our first showdown with the fearsome Jedi hunter known as the Inquisitor. And this Dark Force user has a weapon that makes Darth Maul's double-sided lightsaber look practically quaint. Well, one of the tactics that the fledgling Rebellion is using is pirate broadcasts—although the Empire knows how to manipulate information to its own advantage. The Inquisitor has leaked footage of the Jedi Luminara Unduli (whom you may remember as Barriss' master from Clone Wars) and provided any Rebels watching with the master's precise location. Kanan sees this as an opportunity not just to free another Jedi from Imperial imprisonment, but also to give Ezra a proper master. At the moment, the best he can do is yell at Ezra for not focuses enough and tell him, "Do or do not. There is no try." Ezra, self-involved child that he is, thinks that Kanan wants to "pawn him off" on Luminara, rather than recognizing that this is part of Kanan's own insecurity. Kanan may be Ezra's teacher, but he's not a master. Without the benefit of other Jedi, he worries that his best won't be good enough to turn Ezra into a competent Force user. But hey, there's nothing quite like learning on the job. Kanan, Ezra, Zeb, and Sabine sneak into the facility where Luminara is supposedly held, although they're not terribly sneaky about it. Ezra and Kanan—after performing a nice Jedi mind trick on a couple of Stormtrooper guards—find the cell where Luminara is being kept, only to discover Luminara is long dead. The only thing in the cell is Luminara's mummified remains. So it seems like the corpse was being used to attract Jedi familiar with Luminara (Kanan could still somewhat sense her, but didn't realize she was dead). And the Luminara who appeared in the pirate broadcast footage and in the cell was apparently some kind of projection. "It doesn't seem complicated," the Inquisitor says as he enters the cell. We learn something rather interesting about the Inquisitor here. In his role as a Jedi hunter, he has thoroughly studied the Jedi, right down to their individual fighting styles. And he likes to unnerve his opponent by showing just how much he knows about them. He also has a rather elaborate lightsaber, one with two beams that spin around the handle. My husband and I tried to figure out whether this defied lightsaber physics, since the crystal is contained in the handle of the lightsaber. I thought that maybe there were mirrors around the interior of the ring, reflecting the beam from the crystal. My husband did not like this explanation one bit. Really, what concerns me more is just how Ezra and Kanan got away from the Inquisitor relatively unscathed. I mean, yes, at the end the group of Stormtroopers are thwarted by the amorous pack of flying beasts following the Ghost, but would quasi-trained Kanan and newbie Ezra really have been able to scramble away from the well prepared Jedi hunter? Although he's clearly a Dark Force user, the Inquisitor seems to fall outside the Sith Rule of Two by not actually being a Sith, so whatever training he received from Vader and Palpatine was probably just enough to do his job. 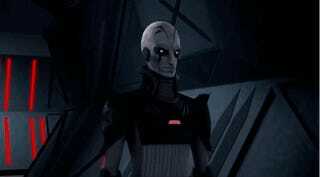 Is Kanan's training ultimately more complete than the Inquisitor's despite the Inquisitor's independent study? Is Kanan a stronger Force user? Or did Kanan and Ezra just get lucky this time? Maybe it was just that the Inquisitor was distracted by his attempt to sway Ezra from the Light Side. Despite the Sith's Rule of Two, it does seem that the Dark Side is always recruiting. But this should, in theory, be the turning point in Ezra's training. He and Kanan have seen the face of the enemy and it is badass. And I suspect that they won't escape so easily from their next encounter with the Inquisitor.